If location and character are what you are looking for then look no further. 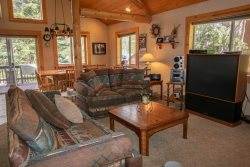 This cabin was remodeled in 2016 to meet all of your vacation rental needs. The best thing about this cabin is the location. It is centrally located in the middle of town with the casinos at one end and the "Y" shopping center at the other. While the casinos are entertaining, the "Y" is where it's at! In 2017 the city revamped the whole shopping center and it now boasts new restaurants, shops and two new local breweries! One of them called "AleWorx" is the town's first serve yourself brewery! They also have live music outside during the summer. It's a nice relaxed atmosphere and a great contrast from the busy Stateline nightlife. There are also great restaurants down at this end of town that you wouldn't normally try if you stayed at the casinos. Cold Water Brewery and Scusa's fine dining Italian restaurant are two local favorites that are actually walking distance. The cabin is about a 4-minute drive from the Y and a 6-minute drive to the casinos, or an affordable Uber ride in either direction! Inside this home, you will find a few unique touches such as the custom penny floors. Yes, you heard that right the floor is made out of hundreds of pennies that is sure to impress your kids! The open concept kitchen and living room have been updated and have exposed wood beam ceilings for that extra Tahoe charm. The furnishings are rustic modern. Off the living room is a huge backyard and a new gas BBQ for summer grilling. There is also a small bedroom with pull out couch on this level and a full bathroom. As you head up the stairs to the second floor you will find a half bath and three more bedrooms. All bedrooms have new double pane windows to keep the warmth in and all new beds and bedding. During the summer you are a short drive to Camp Richardson beach where you can enjoy the famous Rum Runner drink on the outdoor patio and during the winter you are 6 minutes away from Heavenly Ski Resort where you can ski while enjoying lake views! Any time of year this little cabin will hit the mark. Keep in mind, it's a small home with even smaller bedrooms. If you are looking for space, this might not be your house but if you are looking for an affordable cozy retreat, then this is it! "This home is adorable! The owner really put her heart and soul into designing it. I love the location because you can walk to a few delicious restaurants without needing your car!"